I am never sure if this is our first flowering Rhodo of the season or the last. All I do know is that this Chinese species Introduced by Ernest Wilson in 1900 brings a splash of colour this month. 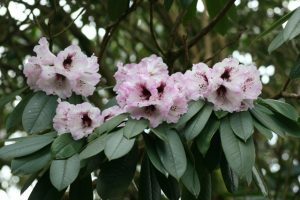 The bell shaped flowers are 7-8cm long, rose-pink to lilac, with purple spots. A splendid sight in mid winter.